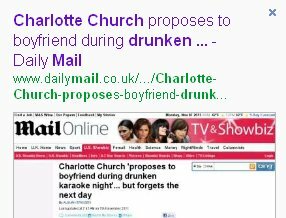 Charlotte Church FORGOT she had proposed to her boyfriend after drunkenly popping the question at a karaoke night. The singer and TV host told pals it wasn't until sobering up the next day that she remembered publicly asking Jonathan Powell to marry her. The Mail's new article, however, fails to admit its role, referring instead to 'reports' and a 'story in the Sun'. It also fails to include Church's quotes about 'lies of this scale' and an 'out of control tabloid industry'.